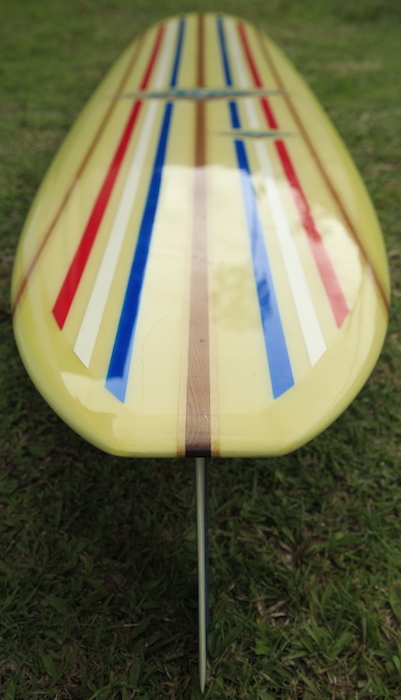 9’11 Hobie Endless Summer Model longboard shape made famous by Mike Hynson in Bruce Brown’s movie “The Endless Summer”. 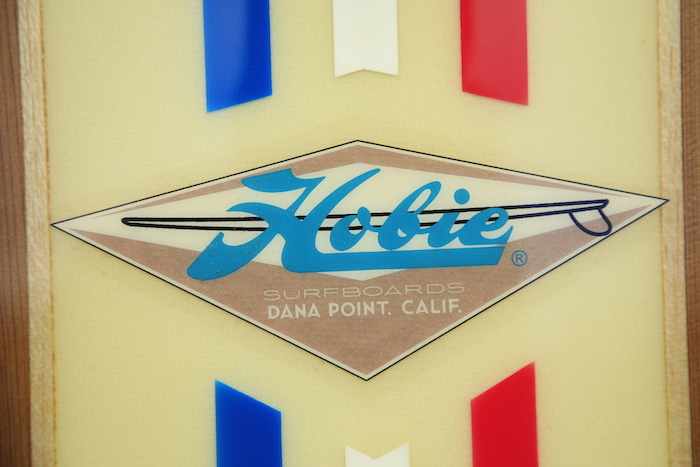 Made to Hynson’s exact specifications and autographed by him on the large Hobie logo. 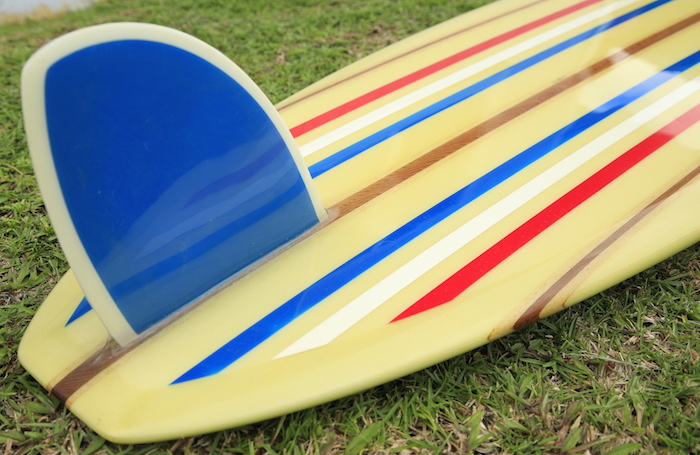 9 stringer (Balsa and Cedar) with 3/4″ Red, White, and Blue resin pinstripes. 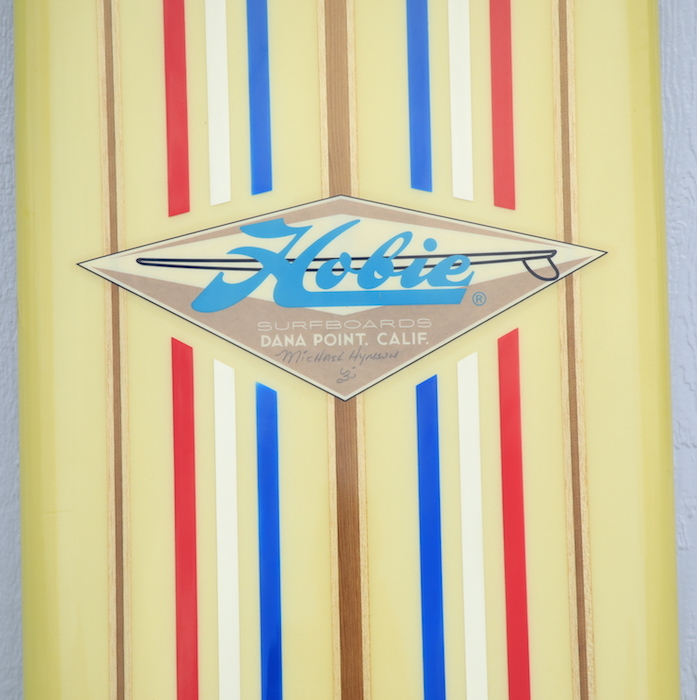 This board has never touched the water and is no longer available for sale at Hobie. Mike Hynson: Born June 28, 1942, Crescent City, CA. Mike rose to fame as The Endless Summer‘s poster boy, fell to Earth as one of the most dangerous men in America, and is being resurrected as one of surfing’s most overlooked design gurus. The Vietnam War or Endless Summer? Thanks to the persistence of the draft board, the decision was a no-brainer for hotshot surfer, Mike Hynson. The producer of The Endless Summer, Bruce Brown, however, still had to be convinced. He had a long list of surfers besides Hynson that he was considering for his movie. Even though Hynson lived above Brown’s garage and they’d discussed the film since its inception, there was one deciding factor that would determine the chosen two. Before anybody flew off around the world on the legendary surfing safari they had to come up with the $1,400 airfare. Now Hynson had another problem, how was he going to produce that kind of cash that quickly? So he hightailed it over to the only person he knew he could count on, his boss, Hobie Alter. Hobie had always come through for him in the past, but in the back of Hynson’s mind he still worried that Hobie had never really forgiven him for stealing six of his surfboards years earlier. On the edge, that’s the way Hynson lived his entire life, from his formative years as a Navy Brat in the forties and fifties bouncing between Hawaii and San Diego, to his timing and innovation that kept him at the forefront of the surfing industry throughout the sixties. He helped found the legendary WindanSea Surf Club in 1962, planted the seed in Tom Morey’s head for the Boogie Board in 1965 at the first professional surf contest, revolutionized the sport forever two years later with his faster, more maneuverable down rail board, and transformed a surf demo into Rainbow Bridge, a cult-film shot in Maui in which he recruited Jimi Hendrix to write the score and perform on stage at the base of Haleakala two short months before his death. surfermag.com Rainbow’s End, by Steve Barilotti, Surfer Magazine. endlessdreamspublishing.com Mike Hynson – Transcendental Memories of a Surf Rebel, by Michael Lear Hynson & Donna Klaasen Jost. surfermag.com Shaper profile of Mike Hynson in The Surfer Magazine Surfboard Guide, 2009.
surfermag.com Interview with Mike Hynson, by Alex Wilson. pursuethepassion.com Interview with Mike Hynson. jacksonville.com Bad-boy surf legend Hynson visiting, by Drew Dixon, Shorelines Staff Writer. allaboutsurf.com Mike Hynson – The Complete Surfer. thecoastnews.com Two Legends Skippers had Different Vehicles, by Chris Ahrens, The Coast News. jobing.com Video: Endless Summer’s Mike Hynson, Pursue the Passion, Las Vegas. jobing.com Blog Post: The Practicalities of Passion, by Zach Hubbell, Pursue the Passion – Phoenix. surfline.com If These Boards Could Talk, with Sam George.